Every year, countless people in Minneapolis seek rhinoplasty consultation. As a leading cosmetic surgeon, we provide expert nose surgery in Minneapolis and Wayzata to patients who want to enhance their noses to correct for injury, improve breathing, or improve cosmetic look. We understand that you may have a lot of questions about your surgery before going into the operating room, which is why our skilled surgeons put together a list of some of the frequently asked questions we hear in our office. What can I do about my unflattering nose? Will you break my nose? What is the difference between open and closed nose surgery? Will it affect my breathing? Will nose surgery affect my sense of smell? I have heard about so many bad things on television, is it safe to have nose surgery? Am I a good candidate for a nose surgery? How many times can I have nose surgery done? Will there be any bandages or dressings? Nose surgery (AKA rhinoplasty or nose job) reshapes the nose. Nose tissue is surgically reshaped, removed and/or added to change nose shape and size. People with unacceptable external nasal shape or size after adolescence or injury choose nose surgery to give a more natural appearance that matches their facial proportions. Some people have a nose shape that is not flattering to their face. Some reasons include facial development, nose injury, or birth defects. Nose surgery reshapes the underlying cartilage and bone to give a more natural, balanced appearance. It is normal for the nose not to be the same on both sides. Surgery can reduce these differences but not eliminate them. It will be necessary for you to adjust to some nose asymmetry after your surgery. Scars are part of all surgery. It is important to understand where nose surgery scars will be placed. Closed nose surgery scars are placed inside the nose. Open nose surgery scars are inside the nose and across the skin between the nostrils (columella). If the nostril needs to be narrowed, an external scar is necessary where the nostril meets the cheek. These can easily be covered with makeup. During nose surgery, it is frequently necessary to narrow the nasal bones. These bones are cut with a special instrument and moved inward. During this part of the surgery a small (matchstick-sized) uncut piece of bone is broken. Closed nose surgery is the traditional way of doing the surgery, where all the incisions are placed inside the nose. This technique is effective for many patients. When second surgery is necessary or when extensive cartilage grafts are necessary, open nose surgery is beneficial. Open nose surgery requires scars that are inside the nose and a small scar across the skin between the nostrils (columella). There are risks with any surgery. Infection, excessive bleeding, abnormal scarring, poor healing, slow healing, skin loss, changes in skin sensation, and muscle or nerve injury, although uncommon, can occur. Difficulty breathing and persistent external deformity can also occur. Finally, although very rare, loss of smell and cerebrospinal fluid leaks have been reported with nose surgery. Fortunately, many problems that result from such complications are correctable with additional surgery. You must understand your risk of complications completely before you choose to have cosmetic surgery. Internal swelling after nose surgery does temporarily interfere with breathing. Most often this resolves in six weeks. Rarely this can persist and require further surgery. If you have difficulty breathing before surgery, it is important to consider internal (septum) surgery at the same time as external surgery. Rarely, changes in airflow after surgery can interfere with the sense of smell. There are always risks to having nose surgery. Serious problems are usually related to excessive surgery and/or undiagnosed medical conditions. I believe nose surgery can be done safely with a high degree of patient satisfaction. Everyone in the United States wants the latest in medical care. Unfortunately, this is not always the best medical care. At times, media presentations will leave out critical information about potential complications, quality of results, and FDA regulations. I am open-minded when it comes to new technology but I would rather not expose my patients to the newest techniques until they have been proven to be effective and safe. Recent advances in nose surgery include open nose surgery techniques. This technique allows precise correction of deformities that require complex cartilage grafting. Nose and face development can continue into the teens. When surgery is done before this time, there is a chance the surgery will have to be repeated. In addition, it may be difficult emotionally to adjust to the surgery during teen years. For these reasons, I suggest surgery be postponed if possible until eighteen years of age. However, exceptions can be made for teenagers who have severe nose deformities that are a result of birth defects (cleft lip, dermoid cyst). For general health reasons, I recommend that all my patients stop smoking. It is clear that smoking increases your risk for developing all sorts of cancers. Breathing problems like emphysema and circulatory problems, including heart attacks, are also linked to smoking. Smoking can increase the risk of coughing after your surgery, which may lead to unwanted bleeding. Finally, the chemicals released from burning tobacco also reduce blood flow, which can result in skin loss during the healing period. Both of these problems can ruin the results of your nose surgery and lead to revision. It is always best to stop smoking. There are other choices when it comes to nose surgery. Unfortunately, other than acceptance of a deformity or changes in makeup style, there is little else that can be done. Always understand all your options before having nose surgery. Surgeries can be combined to yield dramatic and complimentary results. For safety reasons, I recommend the length of surgery be limited to six hours. Except for liposuction, I suggest no more than one area of the body be treated at the same time. Nose surgery is frequently combined with facial rejuvenation surgery (facelift, forehead lift, eyelid surgery), facial liposuction, facial implants, and buccal fat pad excision. This is a question that can only be answered after a consultation. Nose surgery is suggested when a patient feels their external nasal appearance is unacceptable. This may represent a dorsal hump, drooping of the tip, bulbous, or tip excessive size. I feel strongly that nose surgery should not be done if high blood pressure (hypertension) is not well controlled or if you suffer from nose pain. There are many things to consider, including psychiatric conditions, life stress, medical illness, obesity, and motivation. You should be a healthy nonsmoker within twenty pounds of your ideal weight, not going through major life stress (i.e. grieving a death, changing jobs, divorcing), and motivated by internal desires to look better. Each time nose surgery is done, scar tissue is deposited, and the cartilages are weakened. For this reason, I recommend that nose surgery only be done two or three times at prescribed intervals. Most nose surgery in my office is completed under general anesthesia. Patients are completely asleep during the surgery and remember little or nothing of the experience. It can also be completed under local anesthesia that is supplemented with either oral sedation or intravenous sedation. You have the choice. Nose surgery can be separated into four parts. First, a plan is outlined on your nose. Second, the incisions are placed mostly inside the nose such that the subsequent scars are inconspicuous and easily covered with makeup. Next, the skin is elevated and the underlying nasal cartilage and bone are reshaped. Finally, absorbable stitches are placed to close the incisions in the skin and an external splint is applied. The length of time it takes to complete nose surgery is about two to three hours. It takes longer if internal (septum) surgery is done at the same time. You will spend about four to five hours in my office. Frequently, other surgery is combined with nose surgery increasing the time to complete the operation(s). For safety reasons, I limit the maximum time for surgery on each patient to six hours on a given day. There is light nasal packing that I ask you to remove the day after surgery. There is also an external splint that holds the nasal bones in place. It also controls the swelling of the nose. It is removed after five to seven days during an office appointment. 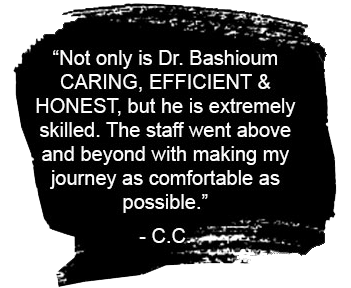 At Bashioum Cosmetic Surgery Center, we are proud to provide expert Wayzata and Minneapolis nose surgery in a comfortable, relaxing office environment. Our friendly staff always makes sure to take the time to discuss your personalized treatment plan prior to beginning any procedure. To determine if you are a good candidate for Wayzata and Minneapolis rhinoplasty, schedule a free consultation with our esteemed doctors by filling out our easy online form, or by calling (877-) 647-6882. We are excited to help you start the journey to a new and improved you today!